Square Enix today confirmed retail rumblings we'd heard from the recent GameStop Expo, announcing that the remake of Kingdom Hearts: Chain of Memories for the Game Boy Advance will be hitting the PlayStation 2 later this year. Dubbed Kingdom Hearts Re:Chain of Memories for extra reading awkwardness, the PS2 version of the GBA original comes with a full coat of 3D paint and a budget price of $29.99. Kingdom Hearts mainstays David Gallagher and Haley Joel Osment return for the remake, dated for December 2nd, with a new batch of mini-games being whipped up for the console re-release. Full details can be enjoyed in press release format after the jump, with a not-quite-done-yet official site going up today. SQUARE ENIX ANNOUNCES KINGDOM HEARTS RE:CHAIN OF MEMORIES FOR NORTH AMERICA Fans Can Now Complete Their KINGDOM HEARTS Experience, as the Missing Link Makes Its Way to North American Shores for the First Time Los Angeles (September 19, 2008) - Square Enix, Inc., the publisher of Square Enix® interactive entertainment products in North America, and Disney Interactive Studios, announced today that KINGDOM HEARTS Re:Chain of Memories will be released for North American audiences on December 2, 2008. KINGDOM HEARTS Re:Chain of Memories is the essential piece that bridges the gap between KINGDOM HEARTS and KINGDOM HEARTS II. Originally released in 2004 for Game Boy® Advance, this full 3D rendition on the PlayStation®2 has never been released in North America - this is an entry in the KINGDOM HEARTS saga that fans of the series can't miss! STORY Sora, Donald and Goofy travel down a long road that meanders through endless fields, and come to a crossroads. 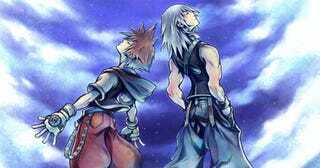 As Sora stands in the crossroads, he gazes up at the night sky and thinks of his lost friends. Just then, a mysterious man approaches from down one of the branching paths. "Ahead lies something you need," he says, "but to claim it, you must lose something dear." The man vanishes before a single path, leading to a castle that eerily resembles a girl's drawing... In the coming journey, what will Sora and his companions gain, and what will they lose? FEATURES # World-renowned creator and character designer Tetsuya Nomura and his team once again unite the magical world of Disney with the characters of FINAL FANTASY®, inviting fans to an enchanting gaming experience # An essential piece in the KINGDOM HEARTS franchise, which has shipped over 12 million units across the globe, comes to North America at long last # In addition to Sora, players can control Riku in this adventure that bridges the gap between KINGDOM HEARTS and KINGDOM HEARTS II # A full 3D remake of the original GBA release, KINGDOM HEARTS Re:Chain of Memories offers a refreshing rendition of the hit title for the PlayStation 2 system # The talented voice cast from the North American releases of KINGDOM HEARTS and KINGDOM HEARTS II, including David Gallagher and Haley Joel Osment, return to breathe new life into the beloved characters # The mini-game catalog has been completely renewed, now with four brand new experiences accompanying the main adventure KINGDOM HEARTS Re:Chain of Memories has not yet been rated by the ESRB. Please visit the Entertainment Software Rating Board (ESRB) website at www.esrb.org for more information about ratings. KINGDOM HEARTS Re:Chain of Memories will be available at North American retailers for the suggested retail price of $29.99(USD).